Summary: Cal and his family live on a remote farm in the Appalachian Mountains where, as the oldest son, he helps his father with the animals and crops. When the Book Woman arrives on horseback and lends the family some books, Cal has no interest in them. He is surprised when she keeps returning, even in a snowstorm, and he becomes so inspired by her courage and dedication that he asks his little sister Lark to teach him to read. Cal’s mother tries to thank the Book Woman by giving her a pie, but the woman thinks that seeing Cal read is the best gift of all. This story is inspired by the courageous dedication of the Pack Horse librarians in the 1930’s who worked to bring books to people in remote areas. Literary elements at work in Story: The first person narration invites the reader to share Cal’s perspective—his initial disdain of reading and books, his growing respect for the traveling librarian, and his desire to learn to read. Casual diction like “jillion miles” or “clippitty-clop” is not only appropriate to Cal’s age but also contributes the sense that he is making an honest, verbal admission. How does the perspective on gender/race/culture/economics/ability make a difference to the story? : The story of this poor, rural family in Appalachia is told in dialect, with spellings and diction to indicate geographical and economic factors of the family. For some young readers, unfamiliar phrases like “the best grub earthly” or “nigh on spring” may be a bit confusing, but there are also plenty of narrative context clues available for following the basics of the story. Theological conversation partners: The gift of education and learning is celebrated in this book, not only by Cal’s discovery that learning to read allows him to experience the wonderful gift of books the Book Woman brings, but also by the librarian’s brave and dedicated work of traveling to a remote area to bring the books. Cal “yearns to know” what makes the Book Woman risk catching cold to bring her wares, and this motivates him to ask Lark for instruction. The Christian life is one of vocation and of seeking understanding, both ideas to which this narrative points. What kind of work does Cal do on the farm? How does Cal feel about the Book Woman the first time she comes? What are some ways Cal’s parents try to pay, or thank, the Book Woman? What makes Cal decide to ask Lark to teach him to read? What does the Book Woman mean when she says “That’s gift enough” at the end? The book review this week is written by Anne Rankowitz, Director of the Resource Center of Charlotte Presbytery and Program Assistant in Christian Education at the UPSem Charlotte campus. 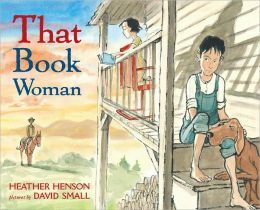 That Book Woman by Storypath is licensed under a Creative Commons Attribution-NonCommercial 4.0 International License.